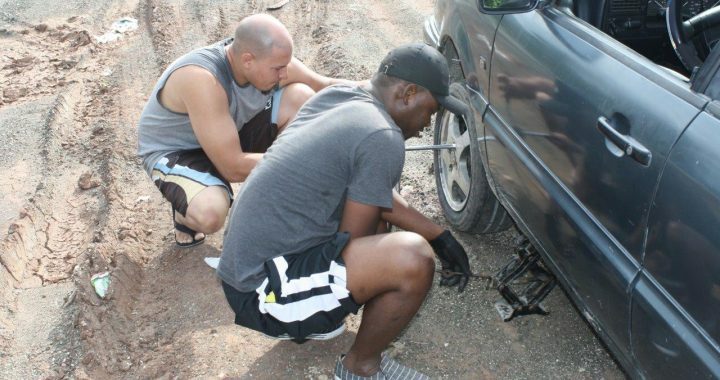 3 Lug Nuts & A Bald Tire – Lagonave Alive! We attended the graduation of Dr. William, a medical student in the Dominican Republic. On our first full day there, we decided to go see the ocean. It is about an hour and a half drive from Santiago to the beach. We hired a driver and William borrowed a car from a friend. While grateful for the use of the car, it had seen better days, ten years ago. The afternoon walking the beach, watching and listening to the waves was about as relaxing as it could be. On the way home, we had a flat tire. The spare tire that came out of the trunk was completely bald. As in, not a hint of tread bald. As our driver was removing the lug nuts, he found some with no thread. He rearranged the lug nuts on the remaining tires so each had three lug nuts that had thread and would hold. So our trip back was on three lug nuts and a bald tire. It made me think about how much of this world lives on three lug nuts and a bald tire. The man walking the beach all day with a plastic bin, trying to sell conch meat. The young guy pushing his food cart up a big hill, looking for a place to stop and for customers. The man with no foot, begging outside the food market. The woman selling beans and another woman selling beans and another selling beans, all on the same street corner. The old man delivering bananas on his bike, dodging cars and insults. The young kids sitting under a shade tree with nothing to do. Our lives are so comfortable and we’re so insulated from people here and across the globe that are living with three lug nuts and a bald tire. Too often, we simply look out the side windows because we don’t want to see the mess in front of us.